Since version 4.9.0, MathGraph32 includes a feature of LaTeX Tickz export of the figure to get the code to be incorporated in a LaTeX document. The figure is the incorporated in the LaTeX document in a vectorial way (and not as an image). Only one restriction at the moment : the images contained in the figure are not exported. Of course it is necessary to have installed on youy computer a LaTeX compiler with package Tikz.. Via menu item Edit - Copy LaTeX Tikz code. This is the most convenient way. Initially the text editor is empty. An enlarge-reduction ratio may be specified. If the figure includes an unity length, this unitye is exported as 1 cm (multiplied by the enlarge-reduction ratio). Clicking on button Code generation makes the LaTeX code appear in the text editor. 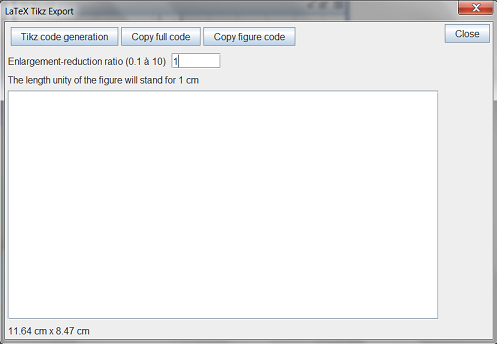 If an unity length is not part of the figure, one cm on your screen will stand for 1 cm on the exported figure. — A part of the editor code is selected : This selected part is copied in the clipboard. — Nothing is selected in the editor and you may have changed the editor text : The full text of the editor is copied in the clipboard. — The text editor is empty : The full code of a LaTeX document including the figure is copied in the editor. If you click on button Copy figure code only the code describing the figure is copied in the clipboard without starting and ending statements. The full LaTeX code of a document containing the figure is copied in the clipboard.